Well management has finally came to the conclusion that a snow plow is needed for the winter operations of the Shasta Pacific to continue. The past 3 years have seen record snow fall in the railroads operational area and something has to be done as the merchants and shippers that depend on the rail service are becoming nervous, and we won't even talk about the mail contract. The company management went south and looked at a used rotary plow, after receiving the price quote and the general manager regaining consciousness the shop foreman assured him that a perfectly usable "Bucker Plow" could be built in the company shops over the Summer and be ready for service next winter. Not only that but a good Flanger could be put together using one of South Fork's old Log Skeleton cars. He assured the General Manager that this combination would be more than capable of keeping the company's trains running on schedule, well most of the time anyway. Heavy wet snow and another scale 5 feet fell before nightfall, operations completely shut down. I have had these plans for one of the McCloud River Rail Roads "Bucker Plows" laying around for years and sort of at the bottom of the "some day" list. I think this plow and a flanger are on the top of the list for this Summer. I think I will build a metal blade instead of the wood sheathed one in the drawings. 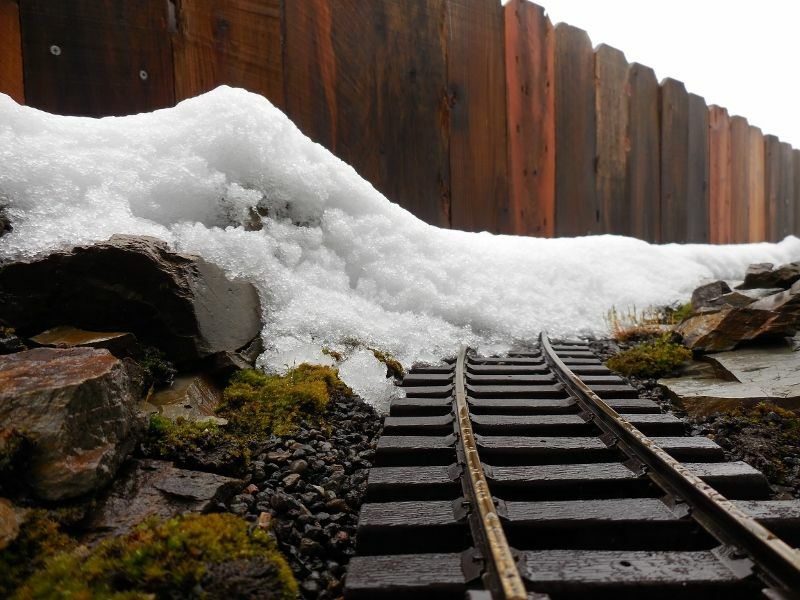 Early posting I guess (for a next Summer project) but it came to the top of the list today when all the snow slid off the covering patio roof and onto the mainline along the fence. As was said in the early days of television "stay tuned"
After this winter my RR would have to build a snow shed over the entire area of operations . I am pretty sure I built a RR. I can't find it. I like the looks of that plow. Very cool design. Can't wait to see what you make of it. Where did you find the plans? That will be one cool little wedgie. I think your boss is right to forget the rotary because it takes a certain type of snow for it to function properly whereas a wedge can power through fluffy to wet stuff. You can also use a wedge to push aside leaves and twigs etc.. I thought I saw something like that the other day while look @ old submarine pics.. It looks more likely a Niagara falls barrel .. The plans were drawn by Bill Roy back in the 70's. Bill had a model building business called McKenzie Iron and Steel Co. in Eugene, OR. He also published a Magazine called TimberBeast. Bill and his model kits and mag were very well known in the logging modelers community. Unfortunately Bill passed away a few years ago. 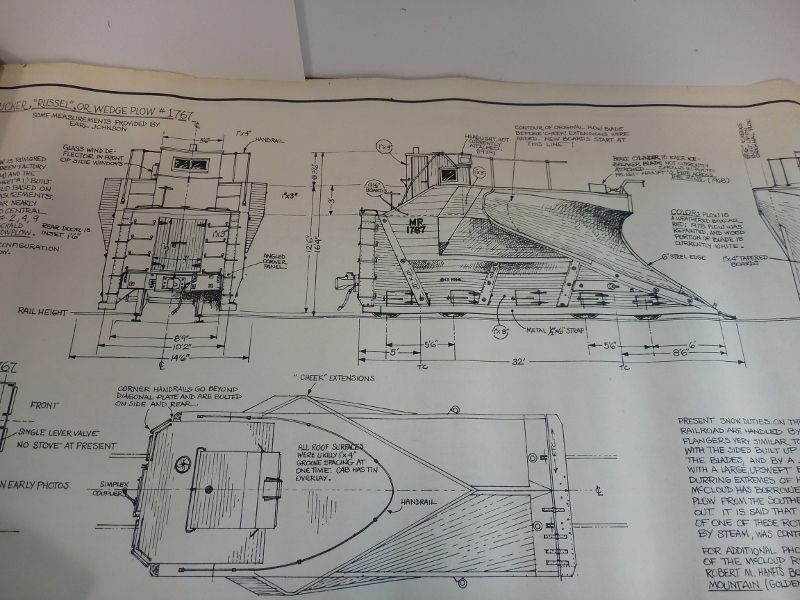 Wiseman Models is now producing the McKenzie line of models but I have no idea where a copy of the plan sheets that Bill drew could be found, too bad because he produced a lot of cool drawings of logging equipment. 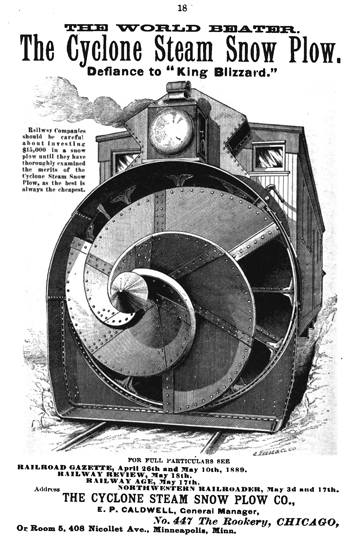 What about the plans that were in Garden Railroad mag. a while a go.. the late Ted Stinson drew then. Now that is different, maybe not quite as successful as a traditional rotary or there would be more of them around. Here's some interesting info on the steam snow plow. P-Town & West Side R.R. Yep, that's the story I mentioned.